The inauguration ceremony for newly elected president of Croatia, who ran on HDZ - the Croatian Democratic Union's political party ticket, is scheduled for February 15. There is no reason for celebration. 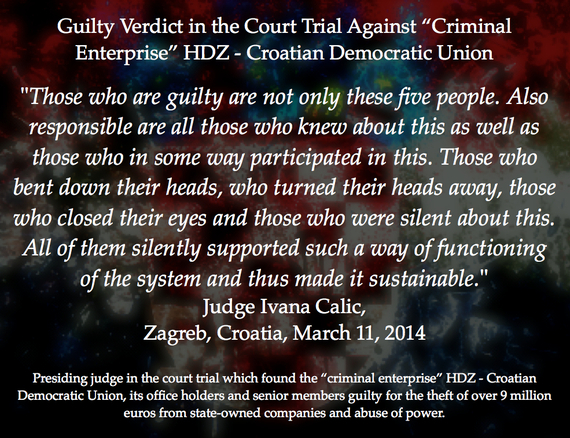 Croatia's brave Judge Calic issued guilty verdicts against HDZ party, former Prime Minister Sanader and four of his close allies on charges of corruption on March 11, 2014 . HDZ's appeal process may drag on until after the next parliamentary election, scheduled for the end of 2015. According to BBC, "Prosecutors accused Sanader of "masterminding" a scheme to divert money from state-run firms and institutions during his two terms in office between 2003 to 2009, making illegal financial gains for the HDZ and himself." For Sanader, this was the second trial - he is already serving a 10-year jail sentence after being convicted for taking millions of dollars of bribes from energy company MOL and Hypo Alpe Adria Bank. Croatia's president-elect is Kolinda Grabar-Kitarovic, former minister of foreign affairs and former assistant secretary general for public diplomacy at NATO. 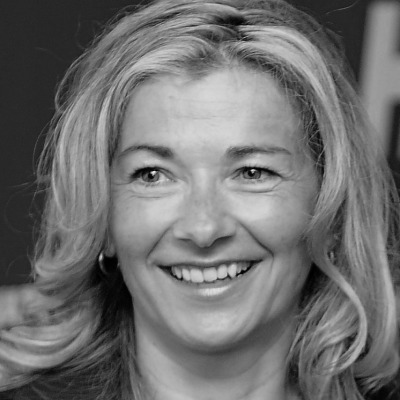 Grabar-Kitarovic has been one of the most loyal cadres for the HDZ since the early 90s. She publicly defended Prime Minister Sanader in 2008, at the time when he was embezzling millions of dollars. Grabar- Kitarovic allegedly attempted to cover-up a heroin scandal at the consulate in Los Angeles by discrediting and firing the whistleblower. Called Croatia's Putin , current HDZ president Tomislav Karamarko is the former intelligence head, former interior minister (police and security) and prime minister hopeful in Croatia's next parliamentary elections. During Karamarko's intelligence and interior ministry stints, Croatia's official passports were given to Balkan criminals. Tomislav Karamarko, was hand-picked by Mr. Sanader to immediately replace the Minister of Interior after the mafia-style assassinations of a lawyer's daughter and media leaders in the center of Zagreb in October 2008. The only result of the investigations under Mr. Karamarko's authority was that a homeless person was jailed for allegedly killing the lawyer's daughter. Tomislav Karamarko eventually appointed his people to police departments. Karamarko was called out for harassment by journalists and anti-corruption activists and condemned by Reporters Without Borders. In a speech after the presidential election results were announced, Grabar-Kitarovic promised to continue the legacy of late President Tudjman. The authoritarian Tudjman proudly promoted and executed the idea of having some 200 Croatia's families own the entire economy. With his entourage of corrupt politicians in the HDZ party, Tudjman was the nation's first president to usher an independent Croatia based on cronyism and massive corrupt privatization deals. The US Embassy cable called it "corrupt, nationalist Tudjman era HDZ". Tudjman set an example of how to suppress freedom of speech and media freedom which was successfully followed by subsequent administrations to date. The nation has become a dangerous environment for opposing voices, independent media leaders, whistleblowers and emerging political parties. 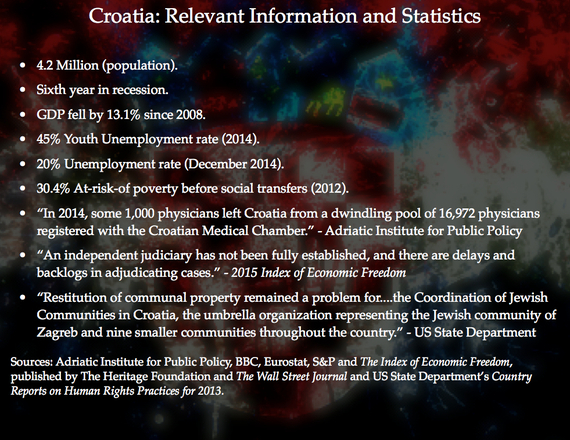 After 24 years of corrupt governments, over $17.5 billion in illicit financial outflows via crime, corruption and tax evasion (based on the GFI studies for the period 2001-2012) and larger amounts since 1991, impoverished, fearful and battered Croatian citizens desperately seek a fresh start. The nation needs leaders of integrity, brave enough to establish the rule of law, protect private property and create the framework for legal certainty. However, conditions for a new start can only be created through international pressure led by strong rule of law nations. 1. 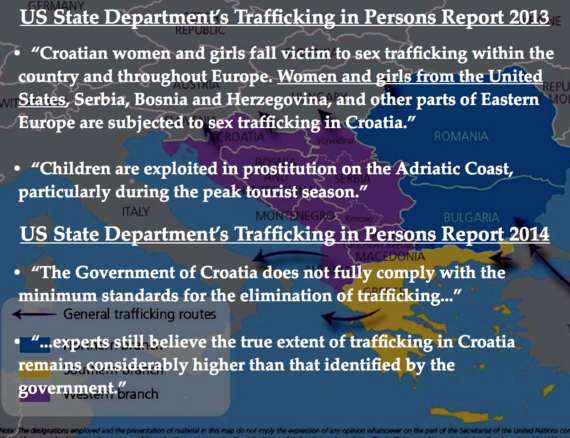 Croatia lies on the Balkan Route, used by organized crime and terrorists, for arms, drugs, human and organ trafficking, and terrorism financing. Kalashnikovs from the Balkans were used in the Paris attacks of January 2015. 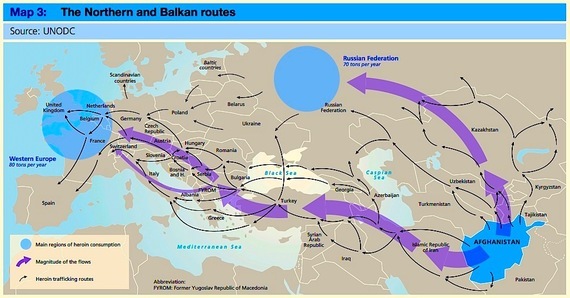 Croatia was selling arms to Syria via Jordan in 2013. Croatian passports have been given to Balkan criminals. 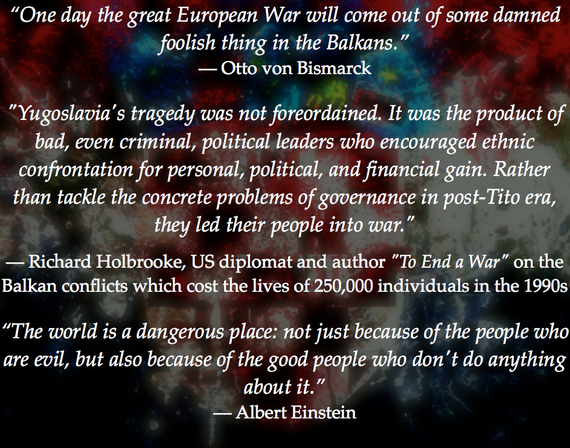 Croatia joined NATO and the EU without fulfilling the rule of law criteria. Senior White House officials admitted in 2008 that in the case of Croatia's NATO accession - "there was a White House fatigue and no proper homework was done." For the past two decades , Croatia's two major political groupings have rotated power while politicians enriched themselves. While engaging in rampant corruption, politicians have blocked judicial reforms, interfered with the judiciary, failed to strengthen the rule of law, encouraged a dysfunctional economy, held fraudulent elections, and brought the government debt down to junk status. Sasha Radović (75), retired colonel and anti-corruption activist, was arrested on November 17, 2011, the very day he announced his candidacy in the December 2011 elections. In his many books, Mr. Radovic had exposed political corruption and unexplained wealth of top state leaders, including then interior minister Karamarko and a military general Cermak. Extortion charges against Mr. Radović were brought by Ivan Cermak, a plumber turned Croatia's general, and alleged war-profiteer whose wealth, including a chain of 63 gas stations, has been investigated by journalists and anti-corruption activists but ignored by Croatia's authorities. Former US Ambassador to Croatia, William Dale Montgomery was on the board of Cermak's company. For over 20 yeas, both political blocks, led by center-right HDZ and left-leaning SDP, used fraudulent voter lists to cement the nation's daylight robbery and widespread political corruption. Following 2011 parliamentary elections, Croatia's electoral fraud was brought up to Croatia's State Electorate Commission, Supreme Court, and raised by Brussels-based The Parliament, a Written Question to the European Commission by Daniel Hannan, member of the European Parliament from UK, and in BBC's live interview with Stefano Sannino, the European Commission's director general for enlargement. None of that rectified the fraudulent election results. Croatia's current Minister of Administration, Arsen Bauk, finally admitted in May 2012 that in his country of just 4.2 million people, "over 1 million surplus voters" were on the electoral list in 2011 December's parliamentary elections. These illegal votes had a potential to determine more than 70 seats in Croatia's 151-seat parliamentary assembly. 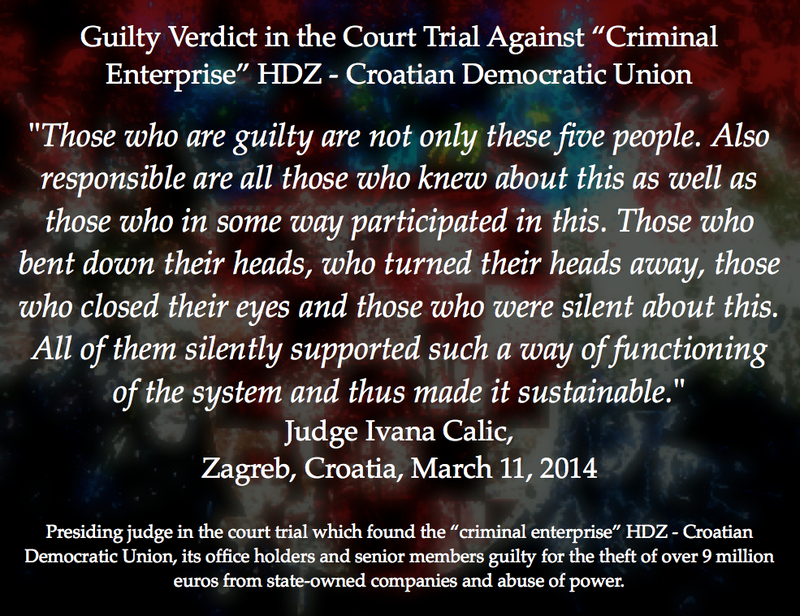 One of Tudjman's close allies and co-founder of HDZ, Branimir Glavas was convicted of war crimes in 2008, and unexpectedly released from jail in January 2015, after Croatia's constitutional court overturned the sentence . In less than one month of his freedom, Glavas was accused of inciting violence, threatened witnesses via Facebook with an image of hangings, and relayed extreme nationalist statements. Croatia's electoral commission, presided by the president of Supreme Court Branko Hrvatin, approved Mr. Glavas' leading the HDSSB political party list in the 2011 parliamentary elections despite Glavas's serving his sentence from 2010 as a war criminal. Three members of HDSSB were reported for murder threats and a physical attack on a journalist. According to published reports, Mr. Glavas is alleged to have threatened a judge and journalists. Strong rule of law nations must urgently address transnational organized crime in the Balkan region's mafia states including Croatia, and, help establish the rule of law and independent judiciary. 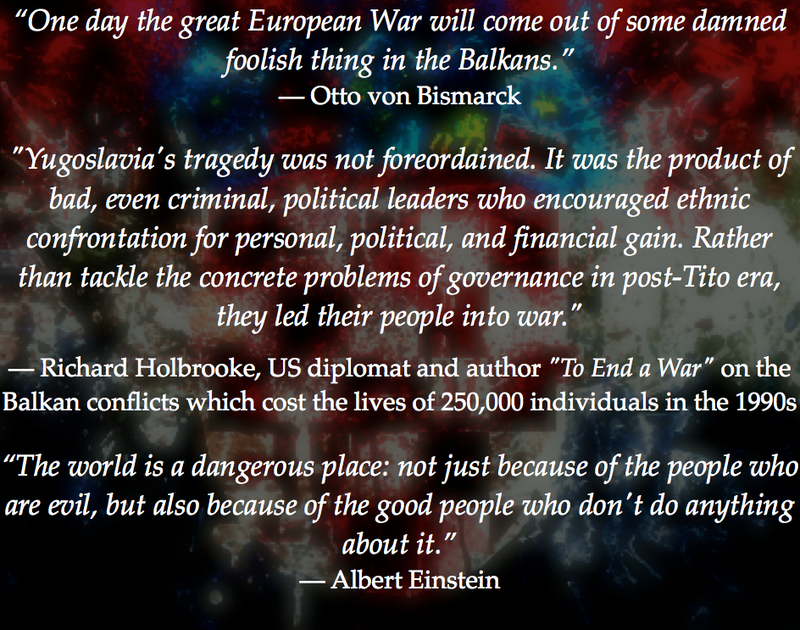 The US Congress has a responsibility to begin a review of Croatia and examine NATO's compromised accession process. On the EU front, elected representatives from member states have a fiduciary responsibility to freeze EU aid to Croatia until the glaring problem of billions of dollars in illicit financial outflows heading to Western financial institutions is addressed and the illicit wealth is confiscated.